This post has been brought to you by AisleStyle and contains affiliate links. I received compensation for writing this post. Photos of dresses belong to AisleStyle. All thoughts and opinions are my own. One of my little sister is getting married in August and so starts the hunt to find the perfect bridesmaid dresses for a rustic themed wedding on the mountain. We have yet to go shopping for dresses but we have been pinning a few dresses on Pinterest for inspiration. Both my sisters and I have different tastes when it comes to fashion; however, we do have a similar taste when it comes to formal wear and shoes. For starters, we all love strapless gowns with a sweetheart neckline. It doesn't matter the length of the hemline. We are seasonal girls which means that more than likely the bridesmaid dress that we decide on will more than likely be knee-length and a light and airy material. We are just waiting on my sister to decide on if we will wear peach or charcoal gray dresses for her August wedding. Its going on six years since I planned my June wedding but I do recall the ordeal of trying to find a dress that was flattering on my younger sisters, best friend, and sister-in-law. Somehow we managed to find the perfect dress and all the bridesmaids looked absolutely beautiful. I heard horror stories of bridezillas intintally sabitosing their bridesmaids by putting them in hideous dresses. I was not a mean bride and wanted my ladies to look and feel as beautiful as possible on my wedding day and I know my sister feels the same way. 1. COLOR. Pick it out before going to the bridal shop. Trust me, it will make the trip easier. 2. COST. Think about your bridesmaids lifestyles. Not everyone can afford a designer gown. Pick a budget that is reasonable and stick to it. 3. FIT. Find a gown that is flattering on all of your bridesmaids. I personally am a fan of A-line dresses and think it suits just about any body type. Make sure the dress is comfortable and that your bridesmaids can actually sit down and walk comfortably in the gown. 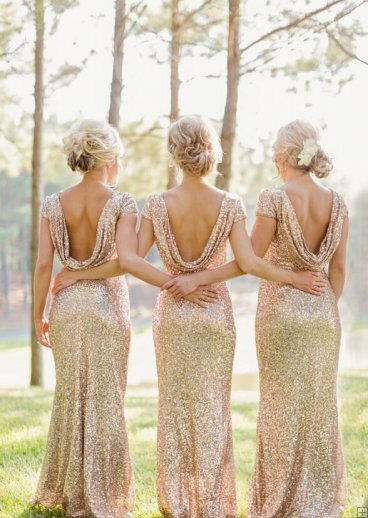 If your bridesmaids are not wanting to match, let them pick their own dresses that looks good on their bodies. This short knee-length tulle dress is so pretty for a rustic or country themed wedding. It also comes in 60 different colors. The fabric is light and airy and the sweetheart cute looks amazing. I love everything about this dress from the illusion of the bateau neckline, the cap sleeves, the lace embellishments, and the buttons on the back. This chiffon gown is perfect for a rustic or country themed wedding in the spring or summer. Hands down, it is my favorite and it comes in 50+ different colors. Its very "A Midsummers Nights Dream" to me and I love it so much! This might actually be the dress that all the bridesmaids wear on my little sisters big day. This dress is gorgeous! I just love the sparkle and shine of the fabric and the open back is just so stunning. I could picture my little sister and I wearing this dress in the middle of woods surrounded by evergreen and cedar trees on Mt Hood. For some reason this dress reminds me of a fairytale. Its so simple but just beautiful. This dress is simple. I love the lace material with the one shoulder exposed. It would be perfect for a bridesmaid or even for a guest to wear to a wedding. 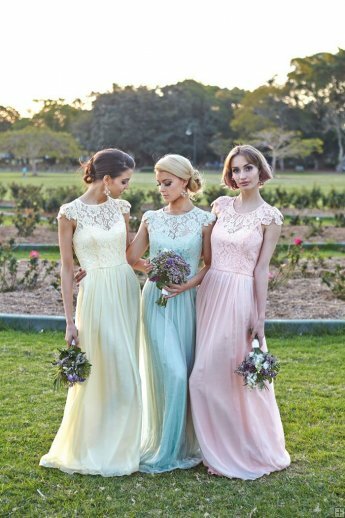 Thanks a ton dear for sharing these latest trends for bridesmaid dresses! I am so pleased to read this post. I have also been thinking to buy my identical gowns for my bridesmaids. You know I am going to have beach wedding at some local beachside Los Angeles wedding venues and would like to buy them beautiful knee length blue dresses.